On the 16th of May we celebrated the Transfer “Reforestation” day. With this event, that took place in the Serra de Castelltallat, Manresa, Transfer Consultancy has contributed in an active way to the reforestation and restoration of an area affected by forest fire. Transfer did this together with 60 volunteers, including colleagues, partners and clients. The terrain, where over 250 trees have been planted, belongs to the family Brugueras who have owed a traditional masia (landhouse) in this region for many generations. Twelve years ago the area was hit by a large number of forest fires and the family had to fight the flames in order to preserve their house. The forest fires have burned more than 22.000 hectares of forest and to this day the trees in the region have not been restored in a natural way. The expectation is that a full recovery of the area will still take about 200 years. 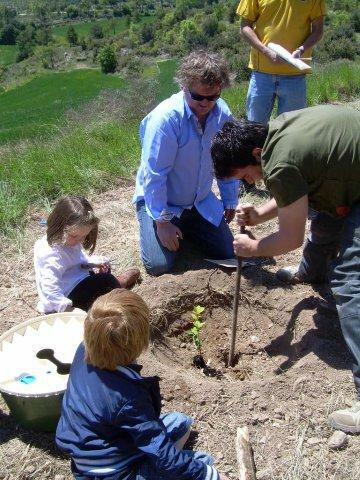 During the Transfer reforestation day more than 250 trees were planted. The new trees will add to the restoration of the area and were planted with an innovative tree planting device. The so-called Groasis Waterboxx is an invention which makes it possible to plant trees without irrigation and to achieve a very high survival rate of young trees after one year. This invention is needed in a country where annually many acres of forest burn in forest fires, the soil is affected by erosion and drought and these problems cannot easily be recovered in a natural way. Transfer Consultancy is the representative of the Groasis Waterboxx in Spain and for 2010 has organized various pilot projects in five regions of Spain. Besides Catalonia, the projects will also take place in Aragón, Valladolid, Zamora and León. The aim of the projects is to demonstrate a 90% survival rate for new trees and bushes to be achieved without any artificial irrigation. The first results of the projects will be expected after the summer. The Groasis Waterboxx recently won a publication in the American Magazine Popular Science as being one of the most important inventions of the year 2010. If you would like to learn more about the pilot projects or the Groasis Waterboxx, please contact us.